I hate to compare dogs. Each is special and unique in their own way. But, I’ve owned a Cocker Spaniel Poodle, a Collie, a Lab/Golden Retriever Mix, and now a Jack Russell Terrier. No dog was as curious as Misha. Are Jack Russell Terriers the Most Curious Dog Breed? Maybe “most curious” is an exaggeration. How about one of the most curious? Is this something specific to Jack Russell Terriers? Maybe terriers have a curiosity streak because of their breeding to root out rodents and other animals on farms. Maybe I just got an abornormally nosey dog. Case in point, you cannot bring any item into the house without this dog knowing about it. I understand food, but what about this? My Dog Wouldn’t Leave Those Ducks Alone! My niece made these cute duck stuffed animals for my mom. Misha had to smell them the minute they were put on the table. But, it didn’t stop there! 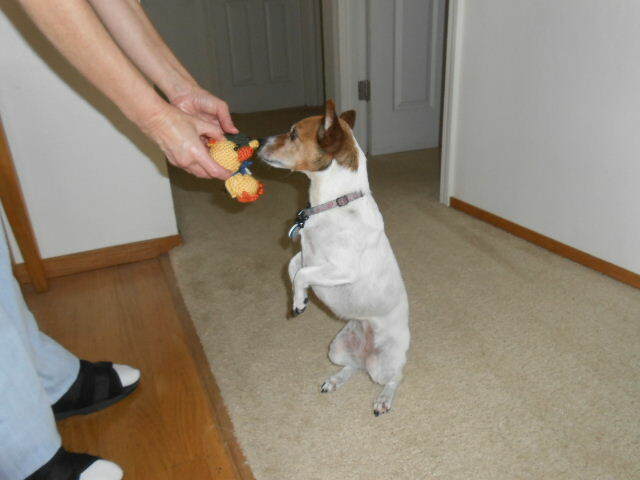 Years ago I taught my dog to sit to get help emptying her treat ball. She learned to apply it to other situations. For two weeks, I’d find her sitting at the end of the hall looking up at the table. Naturally, I’d accommodate her and bring the ducks down for her to sniff. I bet the Encyclopedia of Dogs could tell me which are the most curious dog breeds. I could say it’s because she smells my niece’s scent on them. But, she’s like this with every dang thing that enters the house. Don’t come home with shopping bags! The little four legged inspector will have to check out what you bought. None of my previous dogs cared unless it was food or dog stuff. I do wonder how much of this is breed specific and how much is just Misha being Misha. Tell me your stories! Does your dog have to inspect new things brought into the house? Do you think your dog is more curious than others? Tell us in the comments. Ruby is anxious and so new things make her nervous. Our cat Rosie, however, is very curious and must inspect everything. Misha is ruled by two things fear and curiosity. They are often at odds with each other. Our dog Ginger (mutt) inspects every single thing that comes through the door. Even the humans that live here… sniffs to see where we’ve been without her! Our other dog, Bear (yellow lab), could care less. Debi, Misha is so much like Ginger! Whenever I return, it’s like she is interrogating me with her sniffer. I guess we carry more news than we know.